Case: Doggett’s friend, Martin Wells, wakes up on the day that he is going to die, but that is not the end of the story. This is an episode that doesn’t really feature our main players, very much. 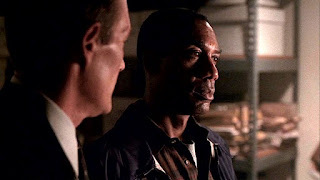 Instead it is a showcase for the acting talents of Joe Morton who, among many other roles, played Henry on Eureka. Here he plays a prosecutor who wakes up in a jail cell, accused of redrumming his wife. He unfortunately gets redrumed himself, later on, by his father-in-law. It’s okay, though, as he just wakes up again, this time on the day before. The theme of time loops, time jumps, time travel, and time going backwards or non-linearly, are very popular in stories. Those themes really seem to capture our collective imagination. After all, we puny humans are forced to take the slow path, day by day. I sure wish that it was possible to zip into the future to see how everything turns out, or to go visit the past to correct a wrong decision. Alas, it is not possible (yet), so we have to make do with fiction. This is a good episode, for one that doesn’t really have much to do with Scully and Doggett. Yes, John is his friend, we are told, but we still spend a lot of time with a guy that we have never heard of before. He handles his predicament rather well; calmly trying to get Doggett to listen to him, though John seems to be more hostile at first. We see John reacting to Martin first on day five, which might explain why John is yelling at Martin. He’s had more time to process the idea that his friend might have killed his wife. Martin, on the other hand, is just trying to stay calm and figure things out. I liked the part where Scully admits to Martin that sometimes these things can happen; she should know that better than anyone, after all. After going backwards, day by day, Martin and Doggett figure it all out; they stop the bad guy from killing Martin’s wife, and then time starts moving in the right direction again, only this time everyone lives. Well, not Ocampo’s brother who killed himself several weeks before, because Martin suppressed evidence that might have kept him out of prison with three strikes. Martin figures out that he has to set things right that just went wrong and he goes to prison himself for his crimes as a prosecutor. There are some cool visuals of Martin’s wife’s erased death, both backward and forward, and it is also neat that this time, she was delayed getting to the house because she had a flat tire. Hmm, very interesting. Watching this, I couldn’t stop thinking about my other favorite tales of warped time. One that I watched that really affected me was “12:01 pm," a short film starring Kurtwood Smith. That thirty minute film really freaked me out. It’s also led to a lot of thoughts of what I would do in a repeating hour, for eternity. Go crazy eventually, I suppose. My favorite episode of Supernatural is "Mystery Spot," which features Dean dying over and over. It’s one of the best hours of television ever, in my opinion. Xena’s episode, “Been There, Done That,” is just hilarious. I love it when she just ties up Gabrielle and Joxer to keep them out of her way. Buffy’s “Life Serial" is another favorite. I love it when she stomps on Giles’ glasses. There is a novel by Kate Atkinson, called Life after Life where the heroine just gets born again, every time she dies. I love that book, it’s amazing. Of course we also have the X-Files episode “Monday," and lots more. Any other favorites? Comment away. Scully: (to Martin) "You do realize that you're not gonna be able to prove this... right? I mean, if tomorrow is really the day before today than we won't have had this conversation." Doggett: "Nah, for crying out loud..."
Scully: "And you'd have to tell us all over again." Doggett: "Yeah well... Make sure I skip that fricking meeting..."
This was an episode that was told from the point of view of the guest star, and it mainly worked because they had a very good actor in the role. I enjoyed it the first time I watched it, but it pales a bit on subsequent viewing. Three out of five hedge animals. Mallena loves her DVR, her Pug, almost anything in the sci-fi, fantasy, or supernatural genres, and her family. Well, maybe not in that exact order. Yes, I love them, too. In fact, Groundhog Day is one of my two favorite fantasy movies (the other is Princess Bride. At one point, Josie and I put together a post that lists all of the Groundhog-esque episodes and movies we've reviewed on the site, and I've just added "Redrum." Joe Morton was also in Terminator 2 with Robert Patrick. I was one of those fans who liked Doggett a lot. And this is one of my favorite episodes of the two seasons he was in. I know that The X-Files will be coming back, maybe this summer or next year for a limited season like last year, and I'm hoping Robert Patrick will at least will make an appearance. Great review. Loved Joe Morton in this. I like your list of time bending TV eps! Thanks, Heather. I forgot to mention Stargate's Window of Opportunity, which is another good one.